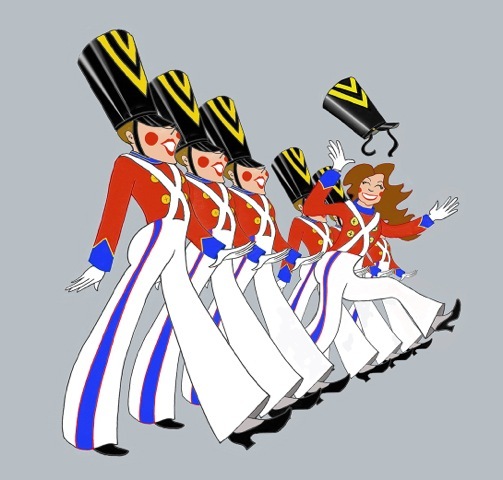 We did auditions in two evenings and one Saturday afternoon because of the kids. I booked ten minute slots. I wanted to see more people, but my director, said if we called in too many actors, our brains would explode (my translation). In hindsight, I could have called in more because of so many no-show actors. But on the other hand, he was right! (Though I still called in more actors on the second and third days of auditions). After seeing too many people, they all start to meld together, making it hard to remember who gave a great read and who just looked the part, etc. Good thing we taped everyone! Lexi Zettle, who’s pictured in my CASTING blog, actually had to leave the audition because we were running late and so she dropped off her headshot- twice! Finally, we saw her on the last day of auditions, and she knocked our socks off (Gentlemen, stay tuned, you will be able to see her in slo-mo on a trampoline in the film). 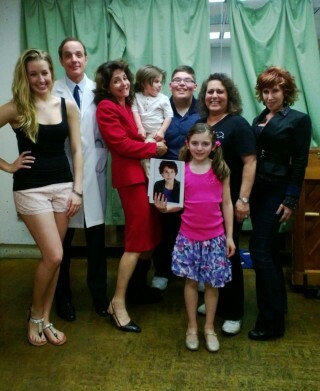 Here’s my amazing cast who not only brought it all to the audition but brought MORE to the callback! (Another note to actor self: no matter how good you are at the audition, you better be more brilliant at the call back!) Left to right: Lexi Zettle, Mark Lobene, me, Anthony Pizza, Nicholas Foti, Randi Kaplan, Simone Lazer. Front row: Alessia Pizza holding MaryAnn Conk’s headshot. Here’s the video of Alessia Pizza auditioning for the role of Kaitlin. Alessia competed with some really talented and cute half pint actresses, but she clearly had the strongest acting chops and could be easily directed. AND lucky for us, she had a little brother, Anthony, who was perfect for the role of Tyler! After Anthony had a mute audition and his Mom, Kim (the coolest stage mom I’ve ever met, and believe me, there are some really scary ones out there—another blog for another day) was halfway down 39th Street with him, his sister, Alessia, and her other three kids (no joke), Anthony decided to come back and show us his stuff! He was hilarious and we couldn’t shut him up if we wanted to. OMG, so cute!!!!!!! We held Callbacks a week later on a Thursday evening to mix and match everyone. My best friend Adrienne Paxton (Emmy Award-winning TV Producer and Jewelry Designer), as a third set of eyes for us. I was so grateful to have her “tell it like it is” and help us choose because I was in love with so many of the actors. It was a tough decision for most of the roles!